I’ve been managing Pinterest accounts for over 3 years now, and if there’s one thing I can say for certain, it’s that pageviews always, ALWAYS drop fairly dramatically between February and April. Every year at Simple Pin, I have to coach clients through this three month period. I remind them that this is normal, and that it is not an indication that their Pinterest account isn’t doing well or that their strategy isn’t working. To start off, I want to share some real numbers from real accounts we manage here at Simple Pin. The first example is from a conference call I did with someone a few weeks ago. She was very concerned about her pageviews, desperately looking for ways to increase them. As we talked, I learned that her Instagram account was extremely successful (bringing in over $1,000 per post! ), and her overall income was growing steadily. But even as we continued to talk about her successes, she was still bringing the conversation back to wanting to get those pageviews up…because she saw other people with more pageviews than she had. The second example of real numbers is from three bloggers that are in my mastermind group. I asked them about their pageviews from the past 2 years. They all said that their pageviews were down, but also shared that their income was significantly higher. Each of them shared that, although their pageviews had dropped by more than 50%, their income had doubled…or even tripled. There is this drive to increase our pageviews, but we forget to look at our income and how it’s growing. Maybe what we’re doing is actually working for us. I have attended four blogging conferences so far in 2017. At each conference, everyone wants to talk to me about their pageviews being down. Everyone is concerned. Yet when questioned, 80% of them say that their income is actually up. And the pageviews were great from October through January, then they dropped off. This makes total sense, because the holidays are an unusually busy time for Pinterest and social media in general. And even though traffic was down, these bloggers were still earning Q4 ad money in Q1 (Q1 and Q4 refer to the quarters of the year, with Q1 being January- March, and Q4 being October-December). 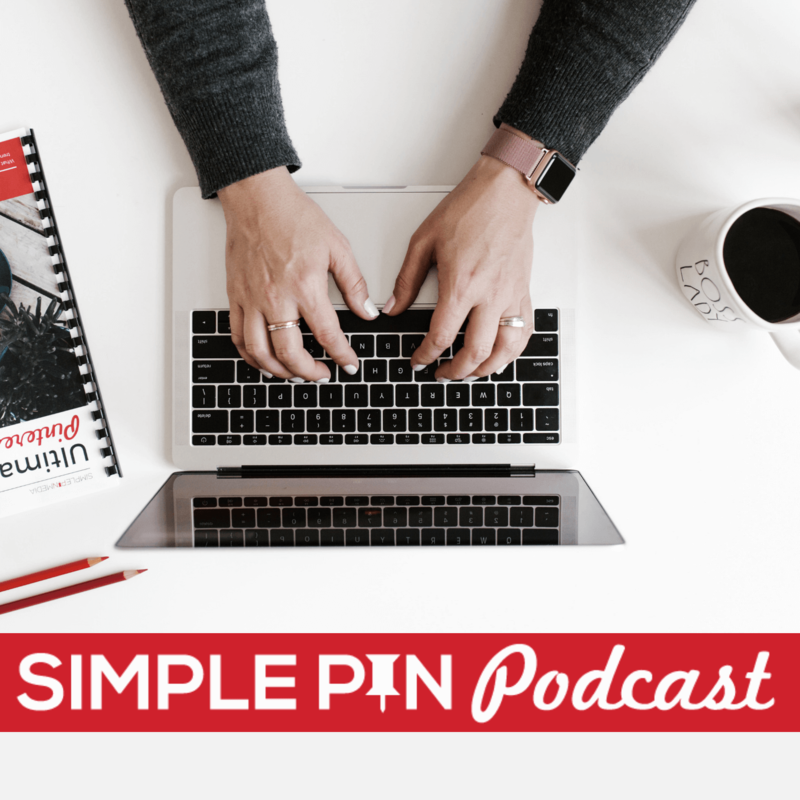 I recently had an email conversation with a client about her Pinterest strategy and some things we were trying. I had suggested that we decrease her number of pins per day. Soon after, she emailed to say that she didn’t think it was working because her pageviews were just so low. So again, I asked about her income. And she told me it had quadrupled. I want my pageviews up…because I know other people are getting millions. What she said is the root issue here. We all think that other people are doing better than they actually are. This comes back down to that whole comparison mindset that we’ve talked about so many times before on this podcast. If the grass looks greener on the other side of the fence, you need to ask some questions. Because it’s not always what it seems. Maybe they do have millions of pageviews, but are they making more money? Do those pageviews automatically translate into more income for them? What you see isn’t always the whole picture. Pageviews do not equal income. Join income and traffic groups with people you trust. Get into a group with around 5-8 people and share your numbers, and encourage each other. Once you see other people struggling with the same issues, you can stop comparing yourself to others. Consider the time of year. Consider your readers. Are they moms who are taking care of their families? Then you know their time online is limited. What season of year is it? Did school just let out for summer? Or did the kids just go back to school? All of this affects how much people are online. Check out the podcast episode where we talk all about seasonality on Pinterest. If you were dependent on Facebook for your business back in 2012, you remember all too well what happened when they changed their algorithms. You likely saw your engagement drop drastically, and maybe you lost a significant amount of business because of it. But you have got to remind yourself, as often as necessary, that Pinterest is not Facebook. One of the lessons I saw people learn through this was the need for more creativity. When you can no longer rely on ads or social media to drive traffic, you have to get creative. Perhaps that means creating products, or just thinking differently about what you have to offer your audience. I’m not talking about a rebrand here; just think about what your specific audience needs and how you can provide that. Do you feel like your head is going to explode if you hear someone say, “Build your email list” again? Do you feel like that’s all you hear from social media gurus anymore? There’s a reason for that! The fact is that the type of personal connections you can make with your audience through an email list are super powerful for you and your business. I absolutely love writing my weekly email to my list. It forces me to sit down and figure out ways to best serve the people who want to hear from me. Do you have people that want to hear from you? How are you serving them? What are you offering that is valuable to them? Are you consistent in reaching out to them? Your email connection to your audience provides the opportunity to share things with them that you don’t share anywhere else. You can share tips and tricks, pointers, special discounts on your own or other products, personal stories, and so much more! It’s like talking to a close group of friends. I know it may sound counter-intuitive, but charging more for your products or services is a great way to test the waters and see what happens. I get that it’s scary. The times I have raised my own rates have made me feel sick to my stomach. What if I lose clients? What if I lose income? What if….???? But you know, it almost never happens that way. Every time I raise my rates, the wait list to come onboard as a client gets longer. Which tells me I need to raise the rates yet again. When is the last time you raised your rates for a sponsored post, or for your own products? Finally, keep in mind that traffic always has and always will ebb and flow. If we stayed on an upward trajectory all the time, we would all be getting millions upon millions of pageviews. Online business changes quickly. So when it comes to pageviews vs. income question, it’s important to keep in mind your own goals, where you want your blog to go, what you are focusing on, and how to better connect with your audience. *Note — here’s a great post from Kristie Hill about tracking RPM’s so you can see how much money you’re making per page view. Take Action– Decide which option you are going to choose to be realistic about pageviews, and how you are going to make better connections with your audience. And then come back and tell me about it in the comments below. Great podcast. I really enjoyed it and some very interesting, and useful, points. People forget seasonality. I was doing some research a couple of years ago into selling household furniture from an online store. The two big periods for selling furniture are spring to mid summer and Christmas. Spring to mid summer is when people move home and want new furniture rather then take the old furniture with them. And Christmas is when people are getting ready for friends and family to visit and need the extra chairs or the bigger table. As for the grass being greener on the other side of the fence. Is that because they are doing something you are not? Or is it because no one is walking on the grass on the other side of the fence? Love the fact you work from a shed. That is so British. 🙂 And you love good cheese. I knew you would be a woman of good taste. LOVE good cheese! 🙂 I think you bring up some great questions! I’m doing this full time and living off of my blogging income completely so I only care about page views insomuch as they can earn me income. I’d rather make $1,000 with 1,000 page views than $25 with 25,000. You can’t take page views to the bank. Plus – honestly – the days of worrying about page views should be over for most bloggers. It’s all about using what you’ve got. You can work hard and barely move the needle with page views. Who knows why certain bloggers get millions? Sometimes you’re doing the exact same things and they had a post go viral and you didn’t. You can learn some techniques to grow your blog, like SEO, and I’m not saying those aren’t valuable – they are. But my strategy is to focus on those pageview growing things for a certain number of hours per week and then get on with it. Obsessing or comparing isn’t worthwhile or productive. Run your own race! Yes! I love that — you can’t take page views to the bank! You’re awesome Amy. When are you moving out here? “You can’t take pageviews to the bank”…That needs to be made into a meme!!! Brilliant. Great podcast and perspective! I take it as a source of pride that my income continues to go up even though my page views remain roughly the same. It means I’m working smarter. As long as my income continues to rise I really don’t care what my page views are. They are simply a vanity number at this point. like the furniture’s, they have their own area of selling like the Christmas time or during the start of the year. Definitely considering the right time during the years, one can hit the desired goals they want.